Is Ukraine ready to vote? Joshua Tucker: As part of our continuing series of election reports, the following is a pre-election report from University of Kansas political scientist Erik Herron. He is currently working with the Committee for Open Democracy on its election observation mission for Ukraine’s 2014 Early Presidential Election and with Cifra Group on its research related to election administration and accountability. This post was composed with significant contributions from Nazar Boyko, Roman Sverdan, and the staff of Cifra Group. On February 22, 2014, Ukraine’s parliament declared that Viktor Yanukovych had deserted the office of president and called for early elections on May 25. In the intervening weeks, Crimea was occupied and annexed by Russia, anti-government protests spread to the south and east, the central government engaged in an “Anti-Terrorist Operation” with casualties on both sides, and ersatz referendums were staged in Donetsk and Luhansk. All of these events occurred under the specter of threats by the Russian government that it could intervene militarily to defend the interests of Russian speakers. While coverage of the Ukrainian political crisis has emphasized violent confrontations, the potential for armed intervention by uniformed Russian troops across international borders, and the implementation of targeted sanctions by the West, election administrators have been working in the background to prepare for the snap presidential election that will result in yet another change in power. Under the best circumstances, managing an election is a serious logistical challenge: 25.5 million Ukrainians voted in the second round of the last presidential election, casting ballots in over 33,000 polling stations. As the election approaches, candidates and voters must be registered, ballots printed, election commissions staffed and trained, security arranged, and information about election logistics disseminated to the public. In a climate of uncertainty, with threats of instability and violence, these tasks become even more challenging. Ukraine’s president is selected by a direct public vote to a five-year term. The winner is determined by a majority-runoff system, requiring a second round runoff to be held between the top two candidates if no candidate in the first round receives 50 percent + 1 of the votes. Since the provisional government gained authority in Kiev, Ukraine’s parliament has enacted several reforms affecting presidential powers and the selection process. The electoral process is managed at the highest level by the Central Electoral Commission (CEC) which has ultimate responsibility for conducting the elections and certifying the results. Implementation of the election is delegated to 225 District Electoral Commissions (DECs) and 33,665 Precinct Electoral Commissions (PECs) that play crucial roles in overseeing the casting, counting, and compilation of votes on election day. In the U.S. context, DECs are equivalent to county-level, or Congressional district-level, commissions. PECs are the polling sites where voters cast their ballots. Just as in the U.S., polling stations are typically located in public buildings such as schools. The CEC is a permanent organization, but DECs and PECs are formed only during the campaign period. Staffing of electoral commissions is partisan, based on party or candidate affiliation. For Ukraine to have a successful election, the DECs and PECs must function effectively. PECs oversee the act of voting, from checking voter identification and distributing ballots, to physically tallying the results after the polls close. Well-trained and fully staffed polling station commissions are a crucial component of a credible election. DECs compile PEC results and adjudicate disputes; unstable staffing could make the completion of these tasks more difficult. These challenges are even more acute given instability in many of Ukraine’s regions. DECs were initially formed on April 14 and PECs were announced on May 6. 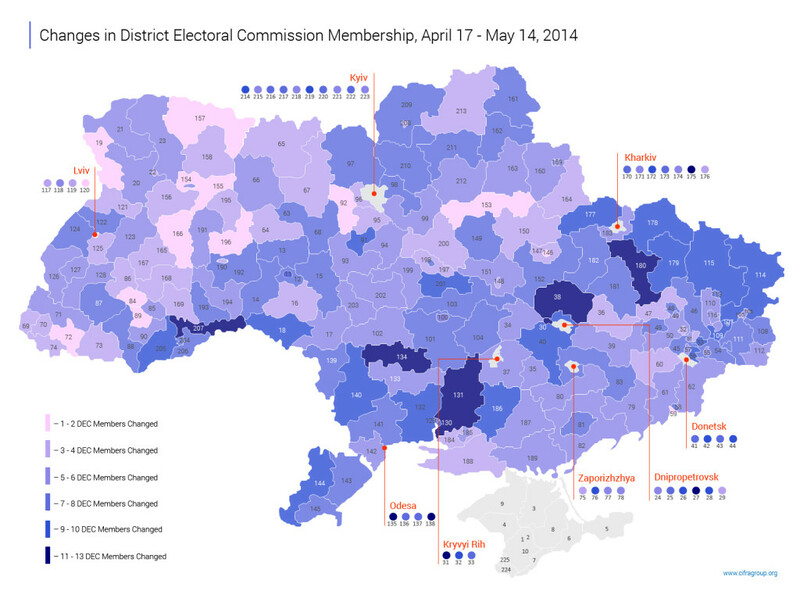 The establishment of Ukraine’s election infrastructure has been impeded in many ways. Russia’s annexation of Crimea effectively closed 12 DECs (1-10 and 224-225). For the remaining 213 DECs, personnel assignments have been unstable, with officials joining and leaving the commissions over the past few weeks. The establishment of PECs has also been disrupted, especially in Donetsk. As my colleague Nazar Boyko at Cifra Group and I have noted in our research on the 2012 parliamentary election, electoral commission personnel changes are widespread between the initial registration phase and election day. Membership on DECs has changed both inside and outside of areas embroiled in conflict. The map below shows the number of changes on each DEC, with greater frequency of changes denoted by darker regions. Areas in Ukraine’s east and south show higher levels of personnel instability. PECs have experienced a different challenge; instead of unstable personnel, candidates have not supplied enough representatives to complete the staffing requirements. The law initially indicated that each PEC should minimally have 12 members, allocated by candidates. This minimum requirement was lowered to nine on May 6, likely due to significant challenges of finding enough willing participants. If PECs could not provide the minimum staffing level, DECs were required by law to supplement personnel, raising the number of PEC members to at least nine. At the deadline for PEC staffing, 191 constituencies had announced the appointment of 352,238 total staff members for their polling stations. Over 38,000 of these staff members were directly appointed by DECs rather than by the candidates. Twenty-two DECs provided no information about PEC staffing at all, and most of these districts are located in Donetsk. The map below illustrates the problem of polling station staffing. The map shows the level of staffing provided by the DECs; in other words, how much districts had to make up for a deficit in staffing caused by the failure of candidates to provide personnel to the polling stations. The proportion of staff required to supplement PECs varies across the country, with Kiev requiring the lowest amount of DEC intervention (0.6 percent) and district 207 in Chernivtsy requiring the highest level of intervention (36 percent). In district 207, candidates nominated 1,050 PEC members and the DEC added 592 members. 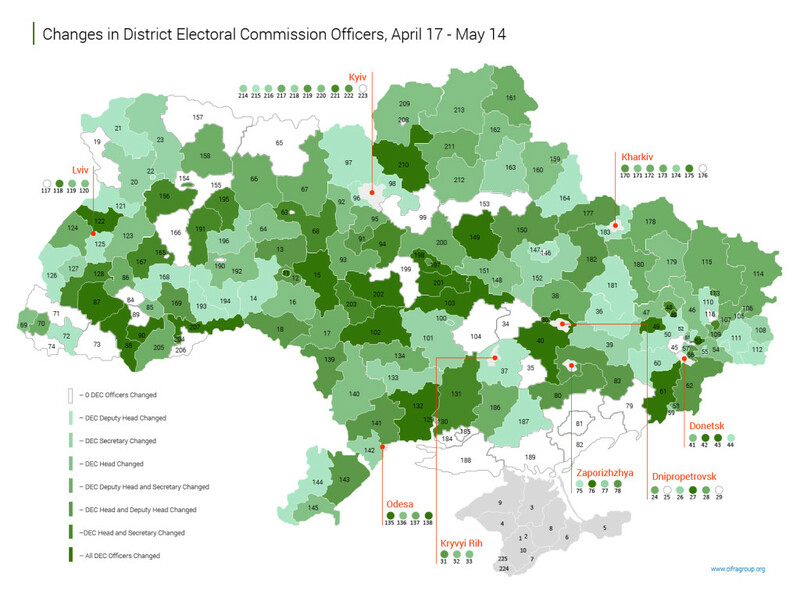 Some of this variation may be due to local elections held in certain constituencies (for example, the contested Kyiv mayoral race also occurring next Sunday may have provided added incentives for people to serve on electoral commissions). Several factors could explain the failure of campaigns to find personnel for the election. The shortened election calendar caused by the snap election could have impeded recruitment. The weakening of the Party of Regions and its administrative apparatus could have undermined staffing; the Party of Regions and its affiliates populated many positions in polling stations during the 2012 parliamentary election. Candidates may not have adequate financial resources to provide incentives for individuals to serve on commissions. The withdrawal of some candidates may also have undermined PEC staffing. In addition, especially in eastern regions, intimidation may have dissuaded people from committing to participate in the election as officials. A critical factor that the data do not reveal is the level of experience on the commissions. If veteran officials are opting out of the process, the election infrastructure may be challenged. The May 11 “referendums” held in Donetsk and Luhansk further complicate the implementation of presidential elections. Polling places and election equipment (e.g., ballot boxes) were commandeered by groups conducting the vote, and some separatists have indicated that they will not permit the presidential election to take place. Large-scale violent demonstrations in the cities of Odesa and Mariupol, as well as active combat between separatist and pro-government forces in the Donetsk and Luhansk regions, threatens the security of citizens who want to participate in the polls and threats are likely to further undermine turnout. Based on data from the last presidential election, impediments to voting in Crimea, Donetsk, and Luhansk alone could affect around 5 million voters, or 20 percent of the voting population. These regions border other large population areas, and if instability spreads, the impact on the voting-age population could be intensified. The atmosphere, especially in eastern and southern Ukraine, is likely to be highly charged over the coming week as the election approaches. Unlike past Ukrainian elections, however, tensions are less likely to emerge due to illicit activities designed to secure victory for one of the candidates. Rather, the process will be under intense scrutiny because some actors are seeking evidence of a failed election while others are hoping for a credible process under extraordinarily challenging circumstances. The quality of Ukraine’s election will ultimately be determined on the ground by the efforts of hundreds of thousands of election workers and security personnel, as well as the millions of Ukrainian citizens who come to the polls.